Hello- this is my very first post! I hope the journey will be promising- filled with lots of creativity. 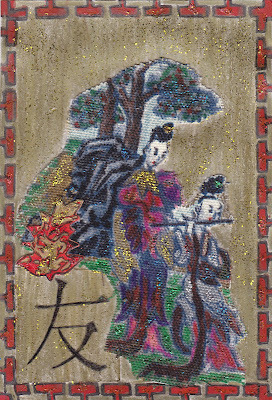 I’m launching my first post with a piece I’ve created for Sunday Postcard Art. This book can empirically claim its place alongside the magna –grand scale productions such as Marc Antony and Cleopatra, Caesar, Samson and Delilah...you see where I’m going with this- The Big Screen. I was completely enraptured. Paramount are you reading this? I don’t think I’ve ever read a book where the story manages to clench my insides and get to that part of my gut where just a tad more would be enough to... and then stops- to just about where I’ve had as much as I can take. Mistress of Rome takes you there. Kate Quinn knows exactly how much we can handle-right upto that very point where you must exhale, to then weave the story into bliss. In this grand novel, the crude is mirrored and diminished by the grand and triumphant splendour of love and tenderness. That being said, Mistress of Rome is also about power, vice, history, raw times and treachery. There’s struggle with moral issues, psychological afflictions and disturbances, scheming ascensions, spectacular gladiator triumphs- and yes, along with it all, as expected in decadent and barbaric Rome, alot of gore, as well. Too much to handle? No, everything is given in just the right dose and is not focal to the magnitude of the story itself. Quinn is spectacular at her craft. The story is told through the perspective of important characters - principally, Thea, the unattainably invincible Jewish slave (gentleness and sorrow behind a stony facade- I loved her! 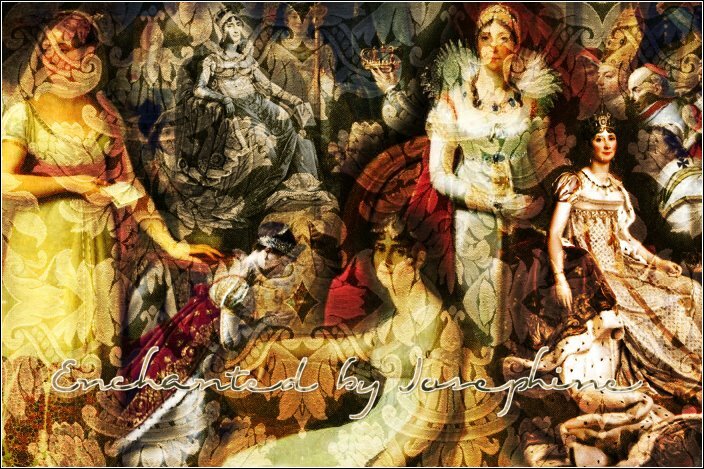 ); the harsh and brutally scheming Lepida (I’m still disgusted...), and Julia, the vestal virgin (my soul cried out for her...). I know that the shifting character perspective is not a favourite with many- but for me, I believe that this actually enhanced the plot, helping to render an excellent story. I loved getting into their heads. Quinn did an all-around amazing job with this superb novel. Ahhh, there is so much to this novel that I just cannot do it justice with one simple review. If you love all that is of the ancient world- you need to read this. 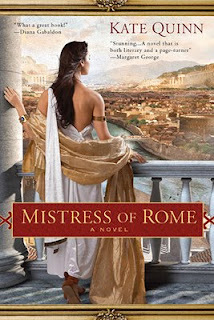 Mistress of Rome gets as crudely descriptive (though in good taste- yes in this novel it’s possible!) as you’d imagine; while being as tender as you’d dream it could be- all that and more. Note: I don’t star-rate my novels (except on sites where I don’t have a choice; Amazon and the like and even then I rarely rate higher than 4 - maybe for a Plaidy, or Gulland's...) Well, this novel is the exception as well. If you’re interested in reading Kate Quinn’s interesting interview, please see Here. 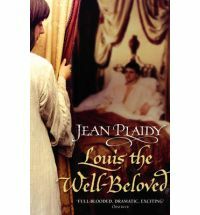 My read for this fortnight is Jean Plaidy's EXCELLENT novel: Louis The Well Beloved. This one is the first book in her French Revolutions Series. It takes a look at Louis XV's life from early childhood to the brewing of the Revolution. 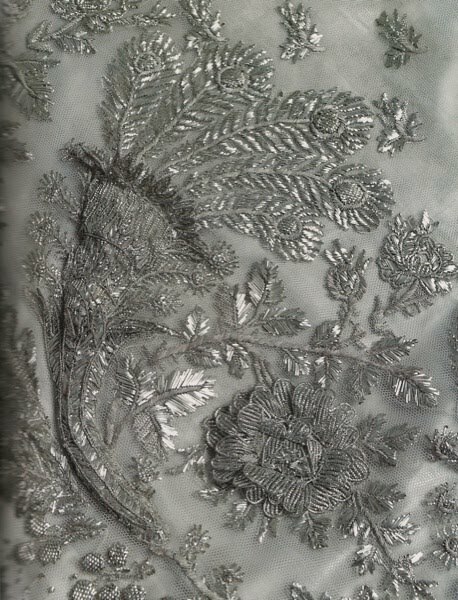 We also get to read about his early relationship with La Pompadour (oh-la-la!). I devoured this book and look forward to reading the next one of this series: Road to Compiegne. Come read my Review HERE. Guest Post by Christy English + GIVEAWAY!! 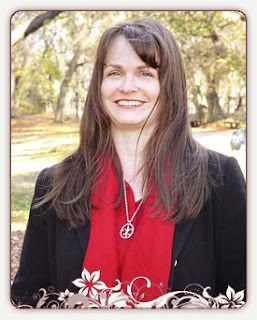 This morning I'm thrilled to start off my week with NEW Author: Christy English here on EBJ. English has written a 'cannot put-it-down' novel on Eleanore and Alais...(upcoming review!!) Today she shares this thought provoking post on who she believes best represents a modern day Eleanore...Read on and then please tell us what you think! 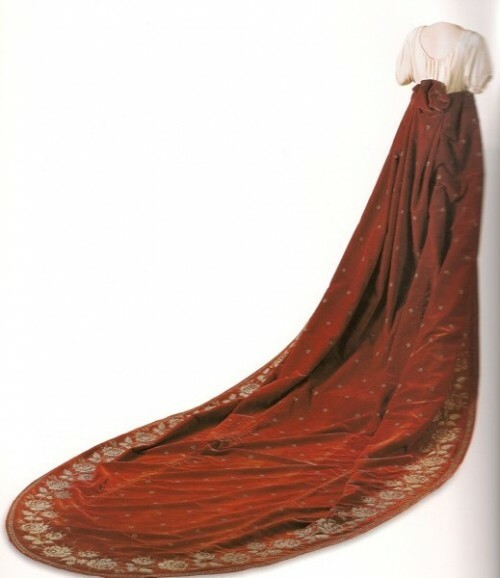 Eleanor of Aquitaine was not a modern woman. She grew up in castles with no light and no heat, with no running water. 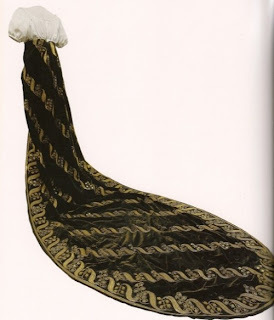 When her father died, men plotted to kidnap her so that they might steal her duchy while they enjoyed her body, thinking to make themselves Duke of Aquitaine. Throughout her life, she avoided abduction through guile and courage. The few times a man actually managed to abduct her, Eleanor always had a loyal defender to drive him off, her first husband, Louis VII of France, her second husband, Henry II of England, and later her sons, Richard the Lionhearted and King John. 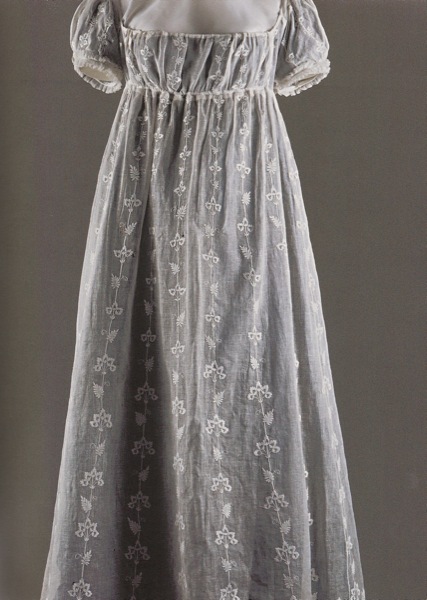 Chroniclers defined Eleanor through whatever man she was married to at the time, or by her sons. I am convinced, however, that no historian, then or now, has ever told the true life story of Eleanor of Aquitaine. Though she was hemmed in by the medieval religious and social strictures all her time, nothing ever stopped Eleanor from doing what she wanted to do. No matter how hard she had to work, or how long she had to wait to achieve a goal, Eleanor of Aquitaine never gave up. These could easily be modern traits as well. Two notable women come to my mind who embody this kind of courage in our own political era are Michelle Obama and Hilary Rodham Clinton. Neither of these women had doting fathers to train them in the ways of statecraft and to leave them in possession of rich duchies upon his death. But, like Eleanor, both of these women have risen to political power through grit and guile, while supporting the men who helped them rise to power: their husbands. In my novel, THE QUEEN’S PAWN, Eleanor of Aquitaine has met her political match in her second husband and rival for power, Henry II of England. Though they have been estranged for years and have not shared a bed in almost a decade, she still holds a fascination for him that he is never truly released from. Even as she plots his ruin on the Continent, looking to make her sons’ take over the duchies of Aquitaine, Brittany and Normandy, Henry still loves her. The love Henry and Eleanor bear for each other outlasts time, mistresses and political betrayals. 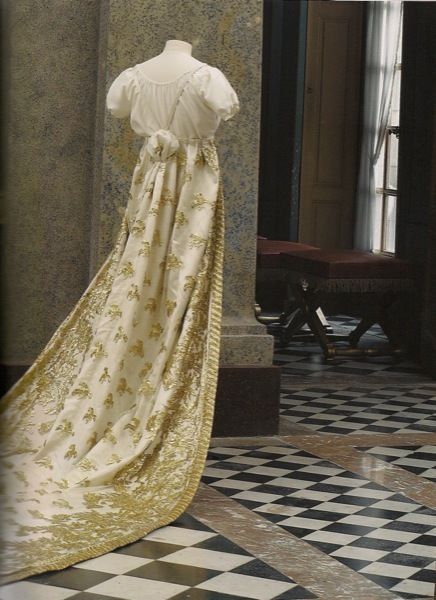 When Henry finally has to lock Eleanor away for the rest of his reign, he knows that if he does not, she will try again to take over his holdings in what is now modern day France. For, in the end, Henry knows Eleanor will never give up; if not kept under lock and key, she would be unstoppable. A modern woman with similar grit is Secretary of State Hilary Clinton. Like Eleanor, time and again, she has remade herself politically in her quest for power. Perhaps, when seen in the same light, Eleanor is a modern woman after all. Now...What did you think of that?! 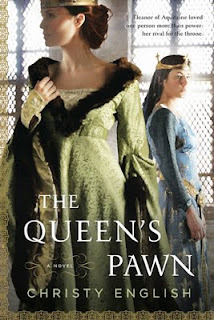 Penguin Group USA is graciously giving away a copy of The Queen's Pawn, by Christy English to one pf my lucky Followers!!! Thank you Penguin! US Only. For 1 CHANCE: Please comment on Christy's post and let us know who you think is most like Eleanore in today's world. For Extra 5 points: Place this on your sidebar with link back to here. EXTRA Chance every time you blog, tweet or FB about this (come back here with your link. Kate from Kate The Book Buff!! Alyce of At Home With Books!!!! Book Review: The Green Bronze Mirror + Giveaway! A mix of fantasy, the ancient Roman world and an author’s early work finally becomes reality. Lynne Ellison started out years ago, when she was but a school girl when she began writing The Green Bronze Mirror . Since then, she has added and perfected her novel to a delightful YA book that is sure to indulge the imagination and historical fancy of anyone daring to relive Rome through the eyes of a fifteen year-old. Karen is a young girl transported back into time through the finding of an ancient mirror found on an island close to her home. From then on it is one experience after another to get herself back home. Karen is sold as a slave numerous times before she finally reaches her goal. Along the way, she meets Kleon, a boy a bit older than herself. Together they flee as they try to escape prosecution and death due to their religion, Christianity. At a time where Nero ruled, not much is possible for a poor slave girl. Nonetheless, Karen survives and even manages to accomplish favouritism and some sort of notoriety for her art and written knowledge. A delightful read that I could not help myself from comparing it to the likes of Alice in Wonderland. There is the same kind of magical flavour, except not as much fantasy. The setting in this novel is based on a true historical timetable. The setting, the customs, the period costume descriptions, the different religious factions are all detailed with great accuracy and quite impressive for a novel of this type. The Green Bronze Mirror is a quick and entertaining read that will surely delight. I would recommend this book to ages: 11-15. The Teacher in me says: For any history teachers out there: This is the book you want for your class. It’s history in story telling format. Great for English lit and history courses alike. And now...I have a GIVEAWAY of The Green Bronze Mirror! Get an extra chance every time: You twitter or post about this (FaceBook too!) come back here with the link. 5 Extra chances for posting this on your sidebar. I have to tell you, but it’s no secret-that Jo-Jo had unbeatable taste. In terms of royalty, I suppose the only one that matched her flair on this subject was Marie-Antoinette, for sure. The elegance and supreme chic of Josephine’s wardrobe is simply to die for. Daughter of Mine-Author Guest Post + GIVEAWAY!!! Today I have the great pleasure to introduce to you a fellow blogger and New Author, Laura Fabiani. Laura Fabiani holds a degree in Special Care Counseling and has worked as a psychiatric child counselor and as a special education technician at various institutions. She launched NouveauWriter http://www.nouveauwriter.com an online resource for new and aspiring writers. It covers topics on writing, English grammar, vocabulary building and publishing and marketing. She also reviews books at Library of Clean Reads http://libraryofcleanreads.blogspot.com. She owns a translation business, mainly translating medical documents from French to English. She currently teaches Creative Writing Workshops in English and French. She lives with her husband and two children in Montreal, Quebec. Visit her at www.laurafabiani.com. Laura has recently published the beautiful novel, DAUGHTER OF MINE (see My Review Here). And now, on to her very interesting guest post...Welcome Laura Fabiani! What do the above three have in common? They helped me write my novel! Let me explain. Two years before I actually sat down and got serious about writing the story I had spinning in my head, I went through a very rough spell. I gave birth to my second child and suffered through post-partum depression, had the worst relapse of fibromyalgia, and a few months later tore an arm muscle—almost as excruciating as giving birth! I looked like a walking zombie. My co-workers no longer recognized me. I had lost too much weight, my face was gaunt, and I couldn’t put a sentence together from the fog invading my brain. I had two children to take care of, but all I wanted to do was sleep, and maybe disappear, like…forever. Instead, I took advantage of all the loving support I had (devoted hubby, helpful Mom, doting sisters, caring congregation) and took some action. I went to see my homeopathic doctor. Within a month, the pain I had been enduring for months was gone! I began to see a light at the end of the tunnel. My youngest sister, Katia, then introduced me to Nia. “I’m just managing to put one foot in front of the other,” I complained. “How am I supposed to do this Nia workout thing?” She ranted and raved some more until I went, thinking it was going to be the usual exercise class. I was stunned. I hadn’t had that much fun in a long, long time. Nia reawakened my creativity, my self-confidence, my sense of pleasure, my love for exploration and daring. Yes, daring. Dare I write a novel when all semblance of eloquence seemed to have vanished from my speech and thinking pattern? I began carrying a notebook with me everywhere and scribbling in it furiously as I supervised the children at the park, the jungle gym, during bath time, and anywhere I could grab a spare moment. I was alive again, and I was celebrating! I was finally going to write that novel I dreamed of. At the time, I had no plans to publish, only to write. For those of you who have read Daughter of Mine, you will note that it is the perfect book to escape with because…well, I escaped when I was writing it. 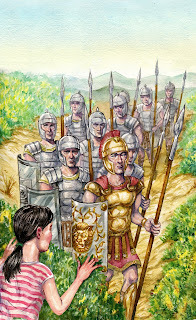 I wanted my readers to be with me in Rome and Gaeta as my main character lived her adventure. Daughter of Mine is not just special to me because it is my first book but because I began writing it at a time in my life when I had to rediscover who I was. Writing it helped me heal—a soothing balm that eased the emotional pain that initially threatened to engulf me. It was a project born of my will to regain my life, to change the downward spiral, and to resurface new and ready to go! My advice to aspiring writers or any I’m-down-in-the-dumps-and-cannot-do-it folks: Take the right action and believe in yourself! Thank you so much Laura. This is truly inspiring! Please enjoy this mesmerizing clip of her book...Italy, the music, the lyrics- simply splendid! TO ENTER: You must be a Follower of this blog. 1 Chance: Leave a Comment for Laura and your email address. 5 Chances for posting this on your Sidebar (send me the link). If you’re a regular follower of this blog, then you know that the only books I ever review are either historical fiction or history (includes art and biographies)...that’s it- except for this time. Huh? 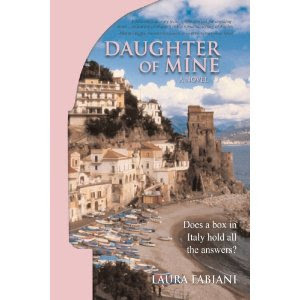 Yes, call it a once in a million time, but this time I was actually interested in reading DAUGHTER OF MINE , by Laura Fabiani. OK, this was just not out of the blue- I was really curious for a number of reasons: Number one, this book is written by a fellow Montrealer- and like me, she’s of Italian origin. Next, the book takes place mostly in Italy and Montreal (two of my favourite places in the world). So...of course I wanted to read this! DAUGHTER OF MINE , is the story of Tiziana Manoretti, a 27 year-old living in Montreal with her parents (nothing of an oddity for Italian Canadians) and set to find the truth about her birth. After discovering that she was adopted, Tiziana leaves for Naples Italy, in search of the story behind her adoption. Why should finding the truth about her birth and adoption become such a dramatic event? Well, it seems that the family has more to hide than to share. A secret lies in a treasured and secret box...When Tiziana discovers its contents, the pieces of the puzzle come together at last. What about love? Perhaps her one and only best friend, Christopher holds the key to that locket...or will love be found through Gian Carlo. Whichever way love takes these men, Tiziana will hold the key to their heart. I loved reading about the familiar places, streets and names of my native Montreal. As well, Italy always captures my heart and this novel brings out its very best. Laura Fabiani spins a tale that is worth the intrigue, suspense, charm and heart warming moments that this pleasant read brings. Beautiful! I’m glad I let myself get swept away in this delightful novel- reminiscent of all that is cherished of the old country, its beauty, traditions and forever typical charming flavour blends perfectly with all that is new and worth holding onto. NOTE: Stay tuned this TUESDAY- when Laura Fabiani Guestposts here at EBJ...GIVEAWAY Included!!! You don't want to miss this! DO YOU KNOW HOW LUCKY YOU ARE??!!! I believe you've just won yourselves one of the best Ancient Roman Historical Fiction Novels ever!!! Who says that all Italian women of the 1400’s accepted their fate without question? Why should they accept that the sciences were privy only to men? One woman, Alessandra Gilliani of Persiceto dared to differ and follow her dream. No one could suppress this young girl's quest for knowledge. 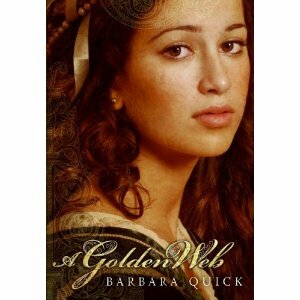 A Golden Web , by Barbara Quick, is a story of hope and inspiration to women of all times. Alessandra, still in her teens dreamt to learn grander things. She wanted to study medicine in the great University of Bologna (the oldest University in Europe). Alessandra was the second of three children living with her loving father and wicked stepmother. 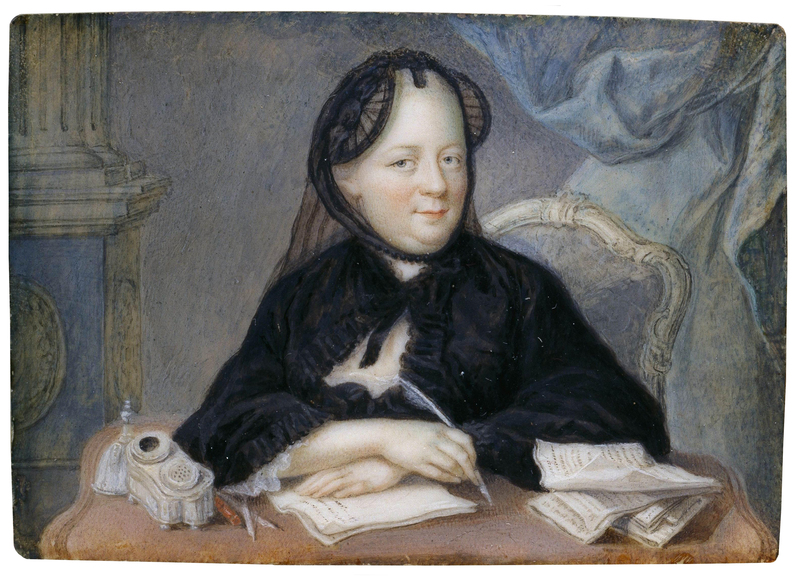 Albeit her knowledge of reading and writing- which she had astutely learned through her father (whose business was the production and selling of manuscripts and illuminated books- a lucrative venue of the times), Alessandra was denied the right to even consider pursuing her studies. Her stepmother had other plans for her, which included the convent and a marriage of convenience. Alessandra never gave up on her dream. 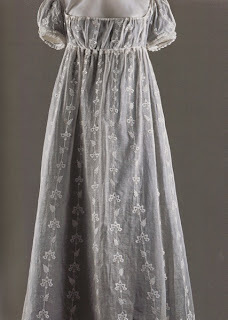 She went along with a betrothal (without ever seeing her bridegroom) and also agreed to the convent life...for awhile. Having learned how to ride and fend for herself with the help of her brother, Nicco, Alessandra had a plan of her own: to escape and finally study at the University. This would include a phenomenal change in her lifestyle...But nothing could stop her. Alessandra would conquer her dream and quench her thirst for knowledge. She secretly prayed to the Virgin- whose face was painted to the resemblance of her late mother...a special icon given to her by her father for her time of need. Later, this icon would prove to be both a life saver, as well as her demise. Alessandra Gilliani would become the first anatomist woman in history- but at a very dear cost. I loved this story as I thrive reading about women achieving their utmost. Alessandra surprised me to no end. I cheered for her as she made her way up the ladder reserved only for men. But ultimately, Alessandra’s tragic life brought me to tears as I revered and mourned this true heroine. This book took me completely by surprise; where I thought I’d be reading about a time in the 1400’s- I got more than I bargained for. A Golden Web introduced me to a young woman that marked history significantly...an unsung hero that contributed life, joy and science to the world by breaking barriers with her courage and youthful loving spirit. A Golden Web is a quick, entertaining while informative historical read filled with love, courage and passion. This is a story I will certainly cherish. Thank you, Barbara Quick for writing this outstanding novel. After reading this, I look forward to reading all of this author’s books! I loved it. Note: At the end of the book, the author also includes a most interesting insight on her research (that is still ongoing! )- I was fascinated to learn about the real historical figures and the mystery behind Alessandra Gilliani-what a delightful bonus to an already fabulous read. Harper Collins is graciously giving away a copy of this superb novel to 1 Lucky US Winner. Thank you! 1 Extra Chance every time you tweet, Facebook or post about this. For this coming fortnight I've chosen Jean Plaidy's Indiscretions of the Queen . I absolutely loved this novel! 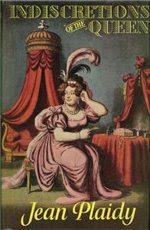 Poor Caroline of Brunswick, what a misunderstood woman. True, she wasn't the most 'fresh scented' - but if you could get past that, you'd soon learn that this queen had a heart of gold. How humiliated she was- and completely alone...Read my review here. What could life possibly be like for a young girl in the 1300’s born albino, and mute because she was butchered at birth? Watermark begins with this atrociously brutal episode and pulls you into the incredible world of Auda. 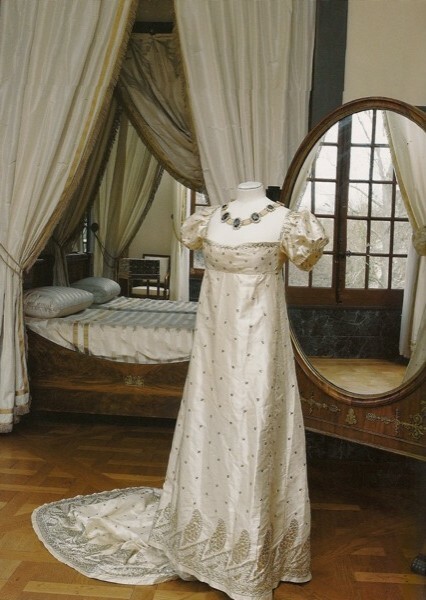 Auda lived in Narbonne with her sister and father-tragically, her mother died giving birth to her. Her father, Martin, was a papermaker during a time of controversy where heretics were burned at the stake for writing and spreading falsities about religion and the Faith. The Inquisitor hunted down all those in any way related to the spreading of heresy...particularly through writings. Since the writing had to be done on some sort of paper or parchment, someone had to be providing this medium for the words and messages to be read...hence; a very troublesome time for Martin and his family. Watermark takes a hard look at the reality of a woman born under incredible circumstances. The 1300’s was no place of mercy;but rather one of fear, treachery and religious turmoil- nothing pretty about this place and time, especially if you were different in any way. Still, Auda captured my heart with her brightness in all senses. 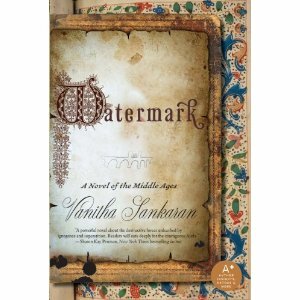 Vanitha Sankaran is an excellent author. Her gentle description of Auda as splendidly magical helped to bring the character closer and more endearing. I was also fascinated by the whole papermaking process described perfectly. I had no idea of the depth of its importance and how crucial a ‘watermark’ could be. I would describe this book as splendid in its harsh reality- and utterly tender in its portrayal of beauty running deeper than its surface. Watermark is being released today- Get it. You won’t be disappointed. Stephanie Cowell's Guest Post here on EBJ!